Anyone have problems with a Gemini/clone? Just bought the Harmony cart and it works great on all of my consoles except the Gemini. It seems to be hit or miss with it. It works fine, next load the menus scroll and stop randomly or stick on one game. I tried it on a couple of Gemini and then back into a Heavy 6'er, Sears Telegames and a couple of juniors...works fine until it is back into the Gemini. Just wondering if anyone had the same problems. Yes, the problem is the controller. It is a joystick/paddle combo and it detects as a paddle. To bypass the detectio, hold down the fire button on boot. Ahhhh! Awesome....I couldn't figure out why it was working intermittently. I was hitting the fire button, but only to match my curse words! Oh, by the way, I use the Harmony on a Dynacom's Dynavision, a Brazilian 2600 clone, PAL-M/60Hz, and it works FLAWLESSLY, never saw any game crash, or anything. Harmony is perfect on the Dynavision. Cool....I tried to test it on all of my systems.....although I didn't try it on the Colecovision expansion. I have a preference for the Gemini....much better response from the joysticks and easier to use. Although my kids have a hard time using them.....they are used to the Xbox! Edited by dobidy, Wed Nov 14, 2012 3:48 PM. The machine always sees the controller as paddle unless i am doing something wrong. Anyone cares to give me a hint? In that schematic there's a switch to redirect the firebutton, but the paddle pot is always connected so the Harmony menu will see it even with the switch set to "joystick". To bypass the autodetection you must keep the firebutton pressed (with the switch in "joystick" position) while powering the console. A better solution would be to use a DPDT switch so that in joystick mode pin 7 is disconnected from the paddle pot. Oh great! I will try tonight. I guess that should work with 2 SPDT as well, right? 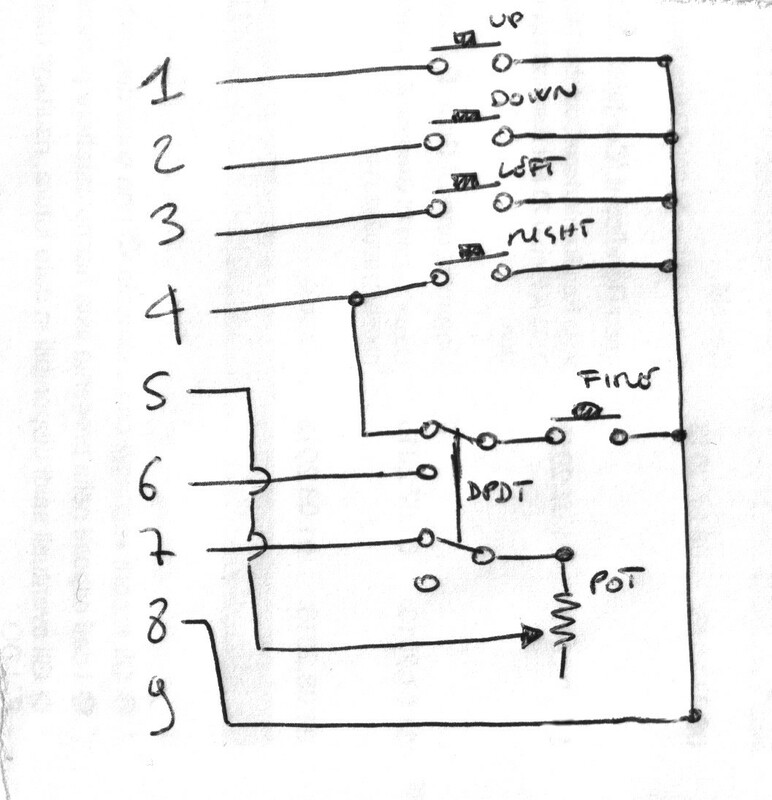 either i can't follow this simple schematic, or it's wrong. it seems that my a2600 can't read the paddle now, both real paddle and combo controller. It just goes from one end of the screen to the other in Breakout for example. 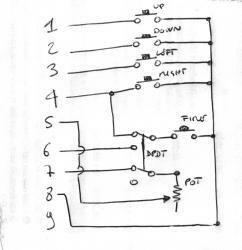 I still get 5V from no7 so it's not a power problem. Well, that is a small error, which doesn't harm anything. since i already tried grounding the pot from the first schematic i had. The problem i have is that my console behaves strange now even with original paddle controllers. It is if the atari (2600AP 4SW) can not sense the pot. I replaced TIA and used the original schematic. The machine was fried I guess. It works fine now. I'll just have to live with Harmony detecting my combo joystick as paddle. I bought a Dynavision last week, and my Harmony doesn't work with it. It crashes in less than 5 seconds turned on. The same Harmony crashes on my Polyvox 2600 after about 2 hours of continuous use and then it keeps crashing. I have to turn it off for a while after using it so I can use it again.